On Stasis, Mobility, and Postmodernism: Tony Kushner’s Angels in America – Angel Daniel Matos, Ph.D. The quote above depicts the moment in which Belize, one of the central characters of Tony Kushner’s Angels in America, challenges the optimistic view of American freedom, and he ultimately challenges idealism and “Big Ideas.” Belize, a black, gay, ex-drag queen and nurse, is perhaps the ultimate embodiment of queerdom in the play in terms of his anti-normative positionality in a mid-1980s America. This liminal position not only allows Belize to notice and question the limits and destructiveness of idealism, but it also allows him to reject it all together: “I live in America, Louis, that’s hard enough, I don’t have to love it. You do that” (Kushner 228). Belize complies with the overall aim and objective of the play, which is the importance of questioning everything in light of the inevitable unsustainability and paradoxical nature of (American) life. In a world full of hate, sickness, global warming, religious and spiritual incongruity, corruption, greed, and inequality, how is it even possible to find stability and meaning? What does it mean to be sexual, spiritual, healthy, or successful in a world where these concepts are approached discordantly by different people? Kushner’s Angels in America, a Pulitzer Prize-wining play which takes place within the peak of the AIDS crisis, attempts to address all of the questions above through the lives of characters who are in one way or another affected by the syndrome. It is through the play’s exploration of AIDS that the goal of postmodernism, which is to question everything, is put into practice. Naturally, the juxtaposition of AIDS and postmodernism is absolutely feasible given their similarities of structure and meaning. In Spaces of Belonging, for instance, Elizabeth H. Jones alludes to Lee Edelman’s views to argue that AIDS and postmodernism are similar in their “disrespect for the laws of orderly representation and hierarchy” (263) and their linkage to contemporary issues such as the “decline of faith in rational, transparent representation” (263). Thus, Belize’s confrontation with Louis, as illustrated above, mocks the view of America as a stable entity, and more importantly, it ridicules Louis’s belief in his knowledge–despite Louis’s assertions, he understands little about his Mormon/closeted/Republican boyfriend Joe, he knows nothing about America, and he is oblivious about how the society he idealizes is crumbling beneath his feet. Here, we observe Elizabeth H. Jones’ views on AIDS and postmodernity manifesting within the play. Roy not only argues that labels place one within a social hierarchy, but he also points out that they serve to represent and restrict an individual to certain forms of being. He then proceeds to establish that labels ultimately indicate how much power (“clout”) an individual possesses. Given that Roy views the label of homosexuality as a label for individuals with no power, and seeing as he repeatedly affirms “I have clout. A lot” (Kushner 51), he challenges the extent to which homosexuality is able to transparently represent him. Though his rejection of homosexuality may seem to be an attempt to disrupt stable representation, he does so by embracing another hierarchical binary: the powerful versus the powerless. It is here that AIDS works as a postmodern agent in the play. Despite the fact that Roy declares himself to be on the top of the food chain, and despite the fact that he declares himself as a man with a lot of clout, AIDS renders him powerless, while simultaneously putting him on the same level as everyone else who dies with AIDS. Despite the fact that he views his power as stable, AIDS destabilizes it. Now, we run the risk of viewing AIDS as a karmic agent in the play, out to feed on the evil and the power-hungry, but this changes when we realize that AIDS is not controlled by power or hierarchy, and there are relatively good and sympathetic characters (such as Prior) who are affected by the syndrome as well. In this case, progress is not viewed as linear, but it is viewed as motion. Progress involves desire, a denial of stasis, and a refusal of order and permanence. Rather than embracing death, Prior desires to embrace life and the ability to keep on moving: “I want more life. I can’t help myself. I do” (266). Immobility, stability, and transparency are impossible in a postmodern world. But as Belize would say, just because we live in it, it doesn’t mean we have to love it. Being, according to Kushner’s play, is not a teleological movement, but rather, a movement with no fixed endpoint. Acknowledgments: I’d like to thank Leanne MacDonald, Evan Scott Bryson, and Lindsay Haney for their insightful comments on this play. They really helped me to sort out my own thoughts in this analysis. Jones, Elizabeth H. Spaces of Belonging. New York: Rodopi, 2007. Web. Kushner, Tony. 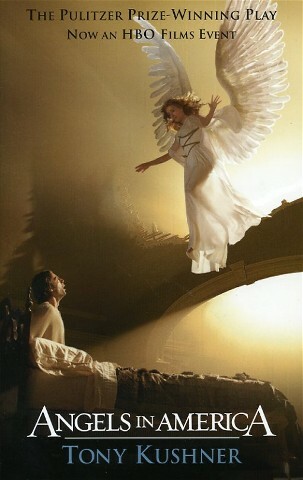 Angels in America: A Gay Fantasia on National Themes. New York: Theatre Communications Group, 2003. Print.